We reach thr 11 something, nobody u noe.. Tak da seorang pun..
We thought "omg, we 3 ppl onia?" die lar.. n frm outside thr, Ain came.. The one who organise this gathering.. 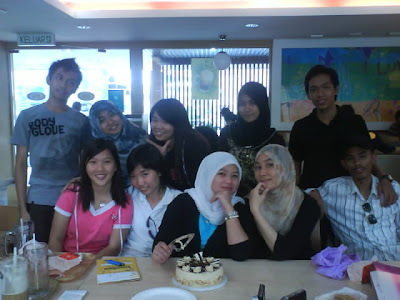 Although nt evryone can make it..but still.. gathering la. n we notice Azam.. Wah, the hair long until cannot regconise... still like that cute la, except the hair is longer oni.. n den Jun came rdy.. 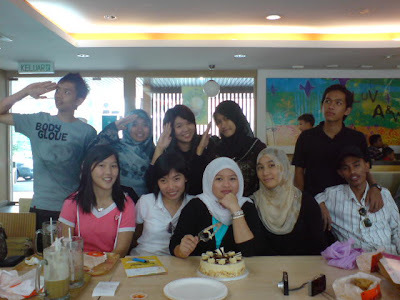 I cannot spot any difference lor, only ther hair lor.. haha..longer + spikier... Then cikgu sue came.. She still look exactly the same.. Abby and Alang and another girl i cannt recall her name came..
n i duno y 3rd batch oso cn go bk for a week wan.. we 1st batch is for CNY ma, now got any CNY meh? y can go bk wan? So unfair !! no need apply oso get 1 week, we apply so hard oni 1 week... hmph.. but over edy la.. hahaha.. lolz.. Then we sing birthday song for cikgu sue as her birthday is on June.. 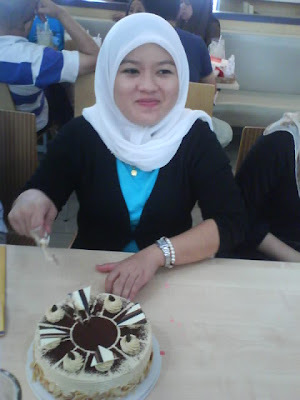 Ain bought a cake.. so nice of her..
Ohh, i tell you, that A&W huh, open only 1 counter.. ishish.. People all need to beratur for only 1 counter.. and is 11.45am brunch time.. they open 1 counter onia..
lolz.. sooryy for complaining too much la.. Just for fun !! No fun, no laughter, very bored lor !! Most of them who came is Charlianssss only 2 Alpha and 1 Bravo and Deltaless.. The cake is nice.. whoaaaaaa! After A&W, we went to Terminal 1.. Terminal 1 okie.. haha.. We walk around aimlessly.. Just WALK.. and finally reach 3pm where Ain needs to go back.. her bus 3pm lor..
Then, We also went back to Nilai.. Then, Yen show us where's her house, and guiding us almost whole Melati near Inti edy.. Memang inti dah.. n then, she drive into Inti.. haha.. I show them my block n which room sumore.. Then we went out, n phewww to Nilai KTM.. So, thats how la we finish lepakking.. It's nice to walk together, haha.. hang out together.. lolz..
n my chicken mummy in malacca jealous liao, coz she cnt come, n we syok syok go jalan2 togthr..
Leo Mission had ended last weeek..At last and finally.. Basically, it is not a successful wan.. This is what I think as a programme master, because the prog dont run well.. Besides, as people all saying, it doesn't even touch the objective of this mission.. Some children may have gain knowledge, but some reli entertainment.. The prog dont run well n yes, im indeed very disappointed.. But it's okie, at least I learnt something.. Seeing those kids doesn't respond to ur planned activities.. that kind of feeling.. fuhh.. But after entering the Petrosains, you see their curious look.. hmmm.. n smiles on their faces... happy to see them happpy..
On Mon and Chun Meng.. I knew them during children camp dy..
two little kids, yi wen n sally.. Inside petrosains.. In the dark ride... Jon, shugan, and yi wen !! Hahaha.. Programme Master! Felt the event was unsuccessful?? Got the answer why was it so?